Byndoor, June 10, 2018: Students and travelers are in serious limbo after the government bus service plying along the rural area since 18 months was abruptly stopped due to legal issues. Though the people are currently protesting the bus service is not moving. The 641 students of Byndoor First Grade College and 1500 students of its PU College and more than 350 students of Shirur PU college are completely dependent on these bus services. Now, they are forced to avail of other modes. The public is forced to spend more than 20-30 rupees daily. Since there are no buses, the parents themselves have to arrange an alternative facility. The rural people have to suffer due to the one sided rule of the transport department. According to official information, along with PSTPC 2/DK 83.84, PSTPC 7/DL 93.94, PSTPC 199/9899, PSTCP 01/UDP 99, four additional permits have been given to private vehicles from Kundapur to Bhatkal. But, there are more than 10 unofficial buses plying along here. The transport office has not taken any action againsy till now, criticize the localities. In regard to the present situation, the KSRTC officials said that KSRTC has ordered to check the permits given by the transportation department. But, as the case is in Lokayukta court and has prevented the transport, correct information is required, they said. 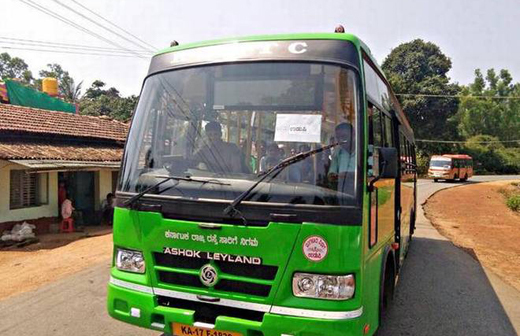 Reasons for the stop in service: The previous MLA of Byndoor was also the president of KSRTC and hence had provided 4 NURM bus service to the rural area. Though RTO had given official permission, KSRTC officials’ hurriedly gave their permission to the district transport department and started the bus service. Private bus owners filed a complaint against this at the lokayukta court and the officials were directed to submit their affidavit by June 19th. Due to this controversy the bus services were abruptly stopped. But, if the RTO officials give permission for the benefit of the people this problem will get solved, say the officials. The bus service to the rural areas of Byndoor greatly benefits the students. Ganganadu, Maddodi, Goliberu, Todali Shirur are at a distance of 10, 8,12,9 kms respectively from Byndoor junction. The students have to walk at least a kilometer of two through the forest to catch a bus. These buses are the main and only service for the students to reach Byndoor, Bhatkal and Kundapur. But, since they have no alternative facility they passionately wish for the service to be reinstated. A few students had to inevitably discontinue their education due to this debacle. Problem faced by the officials: “Altogether 66 bus permits have been given for government buses in Udupi. Out of them, only 30 buses are providing service. We give the permit only after registering the bus number. But, the KSRTC officials did not ask for new bus permits, they are confusing the people by running the buses on old permits. Even now if they ask for permits we will provide it. We will take action against illegal private bus service between Kundapura-Bhatkal, If we get a complaint,said Udupi transport Office.